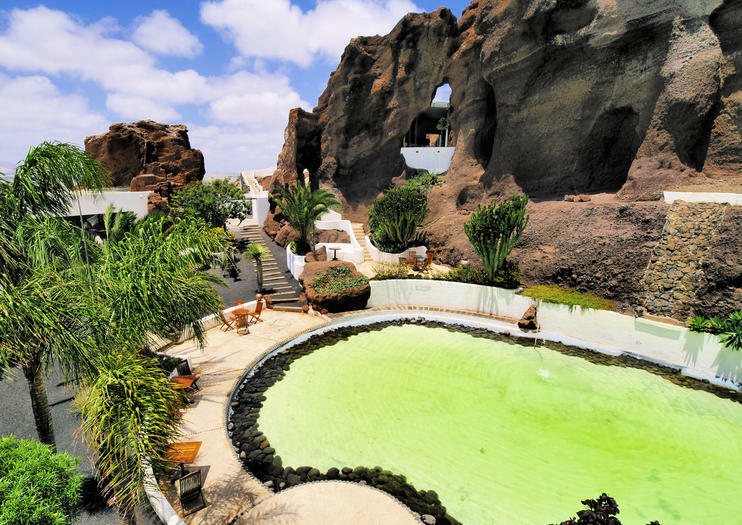 Get a taste of Lanzarote in more ways than one at LagOmar, where its museum, restaurant, bar and cottages are all wrapped into one magical lava-rock landscape. Once a private home, the structure was built into a volcanic quarry, lending to an oasis-like setting filled with caves, spectacular island views and unique gardens and architecture. The private property was conceived by local artist and architect César Manrique, designed by José Soto and later completed by other architects. Perhaps more famous than LagOmar’s creators is the story of its once owner, actor Omar Sharif, who came to the island to film a movie, fell in love with the property and purchased it. But alas, rumor has it that he owned it for only one day before losing it in a bet over a bridge game. Whatever the history, today’s property can be visited and enjoyed in a variety of ways. Go there to check out its museum, where you can learn more about LagOmar and also view revolving art exhibitions. Or just come for dinner and drinks; by night, the property becomes awash in magical lighting that takes its caves, cocktails and Mediterranean meals to an altogether otherworldly level. Then, you can stick around even longer if you wish, as the Lanzarote getaway also offers two-person cottages. LagOmar is centrally located at Lanzarote and just a 15-minute drive away from the coastal city of Arrecife. The museum is open every day of the week from 10 a.m. to 6 p.m. Hours: The museum is open every day of the week from 10 a.m. to 6 p.m.